This one irritated me. Not only were the claymores wireless, but there were some big continuity issues with them appearing and reappearing, changing spots etc… Don’t even get me started on the fact the effect they had on the bad guys was minimal. There were also other sloppy things that annoyed me, such as at 58 seconds when he removes a full mag, takes it behind his back and re-inserts it into the gun for the reload. I know the videos are supposed to be fun, and 99% of the people watching them don’t know or don’t care if they are even remotely accurate, but this particular video I just didn’t like. I can overlook the fact that none of his videos have ejecting brass in them, and the physics are always greatly exaggerated. Well then, do better asshat. Most of Freddiew’s stuff is based off of video games and that culture. As a gamer and gun lover myself I can see both arguments but his videos are fun. This one I think was based from metal gear solid, a number of other ones have many Call of Duty references in them. Super fun to watch. I agree with Cobrar, they’re fun video game-inspired videos done by amateurs. They do seem to be getting more creative with stunts, but it’s still just imaginative nonsense. And the mag being full when removed is because the airsoft magazines have fake bullets in them to better mimic the real G36. I read some of the gamer-comics and the freddiew stuff is in the same vein, but live action reimaginings. 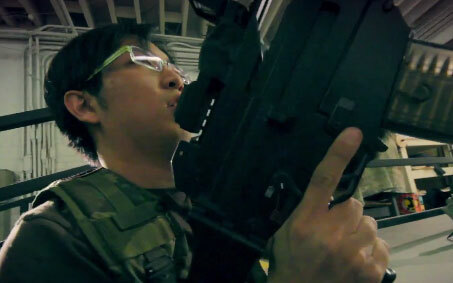 The RoF on that G36 is too slow and the sound effect is off – even for CoD type games. But he does do some impressive work and as pointed out, claymores are never done properly in games. ok, reference time. This is sorta like the time crisis video; its not about reality, its about how you play that particular game. No one is really gonna rapid fire a pistol with the index finger on their support hand in real life, but it works GREAT in the arcade. There is a game called Metal Gear Solid. Take your pick on which one you prefer, exactly, but the opening music is the theme song. In the beginning, all you have is a knife and a pistol, but after you get a few real weapons, you start getting cocky. instead of sneaking, you purposely set off alarms just to get into gunfights. Its a joke on that game, really. I am suprised he didn’t have a bandana that gave him infinite ammo, or a suit that turned him invisible. Dont make me break out the SKS rule. Yeah, because the SKS most definitely doesn’t use a magazine, huh. Freddies stuff is just fun. End of story! I agree with the general consensus. These videos are not made to be realistic, rather enjoyable. And I am a huge fan of freddiew’s videos, they are very creative, and have great editing. “I tend to watch his videos purely for enjoyment, and not tactical advice ;)” … best comment I’ve read in a long time! The up-close gun uses shell ejections, well I didn’t watch that close, but he made a tutorial on it a while back. The effect of a real claymore is a helluva thing to witness; nobody ever gets them right, and I’ve given up caring. This is just Freddie being Freddie. Indeed. it’s like playing video games. I play Modern Warfare 2.. but it is nowhere near realistic. There are idiots out there who think it is.. but there are so many issues with it,, too many to count. But I don’t play it for realism, its for enjoyment. People who think movies/videos/games are realistic are just ignorant and have no idea what they are talking about. The guys getting bent out of shape over this gotsta chill. As others have said, it’s a gamers reference. Planting a bunch of clays at a choke point and then picking off baddies as they come through (trying to use the clays sparingly and as a backup if you miss). Playing COD with ammo hacks you can fill a whole parking lot with clays and watch the bad guys fill it up and get blown away…or crash your computer because of overstimulation!! AAAAHHHH! I liked his early videos, but that one was just bad and obvious airsoft. If this was COD, he would have gotten grenaded already.